Our Lunch Menu is Available 11am-3pm Daily. Rib-eye sauteed with onions, peppers, mushrooms, mayo, lettuce, tomato and banana peppers. Topped with White American cheese. Fried chicken breast laced with marinara sauce and topped with Mozzerella cheese. Served with a pickle and chips. Meatballs wit mozzarella cheese and a side of sauce. Served with a pickle and chips. Sauteed sausage, peppers, and onions laced with sauce and topped with mozzarella cheese. Served with a pickle and chips. Roasted red peppers, grilled onions, Portobella mushrooms, spinach and herbed goat cheese grilled on ciabatta bread, served with marinara sauce. North Carolina Farm Smoke Brisket, caramelized onion jam, shredded mozzarella, garlic mayo served on a ciabatta bread and side of Aujus. 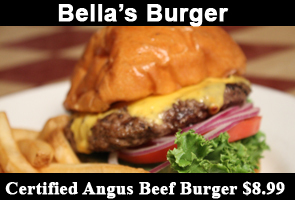 A half pound Certified Angus Beef Burger served ona Broiche with lettuce, tomato, onion and mayo. Grilled deep fried or blackened chicken breast topped with bacon and Swiss Cheese, mayo, lettuce, tomato, onion served on a toasted brioche. Crispy bacon, fresh lettuce, and tomato with homemade garlic mayonnaise and fresh mozzarella served on grilled ciabatta. 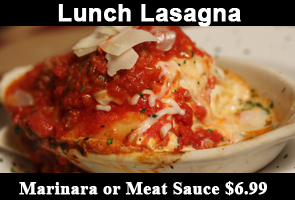 Homemade lasagna made daily and served with your choice or marinara or meat sauce and garlic bread. Jumbo Ravioli stuffed with a Ricotta cheese blend served with your choice of marinara or meat sauce and garlic bread. Tossed in Pancetta, onions, and peas with cream sauce. Chicken tenders fried to a golden brown, served with your choice of dipping sauce, coleslaw and French fries. Bowl of soup and House salad. Choice of soup:House or Soup of the day, choice of dressing: Creamy Italian, Homemade Bleu Cheese, Greek Feta, Honey Mustard, Caesar, Thousand Island, Ranch, Italian, Balsalmic Vinaigrette or Parmesan peppercorn. Romaine Lettuce, cucumbers, red onions, artichoke hearts, pepperoncini, black olives, tomatoes, and roasted red peppers tossed in Greek Feta dressing and topped with crumbled feta. 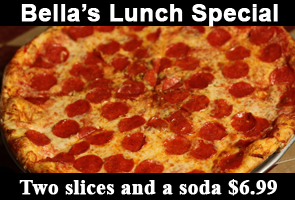 Two New York-style Slices of pizza with one topping each slice and a soft drink. Available Sundays Only. Buttermilk fired chicken, house-made andouille sausage gravy, mashed potatoes, Melba Sauce and maple syrup. Sliced Roma tomatoes, basil, Ricotta, fresh mozzarella, garlic, and olive oil. House sauce with cheese and aged pepperoni.